Further hints on the care and feeding of tubes (valves) from an expert. Reading Mr. Kornacker’s article entitled “Current Regulated Heater Supply” in audioXpress of April 2003 prompted me to look a bit closer at the behavior of heaters and filaments. 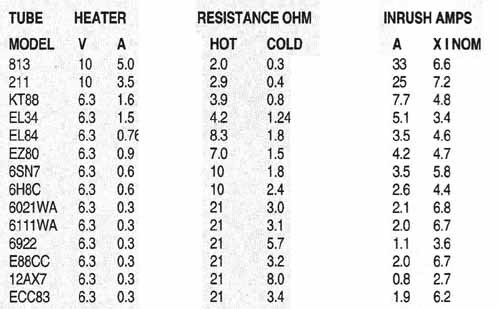 Calculating the hot heater resistance from the tube specs and the inrush cur rent from the measured cold resistance produced the results shown in Table 1. 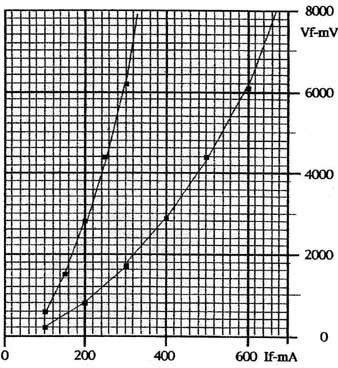 The inrush current varies from 2.7 to 7.2 times the nominal value. The calculated inrush current values will be a bit lower than listed because the power- supply inner resistance and the cold resistance are adding up. The 813 and 211 have directly heated filaments with a low mass and a high inrush current, so they heat up quickly. Still, these Sylvania and RCA tubes have a long lifetime. The 12AX7 and ECC83 each have two well-matched heaters. The Sovtek tubes (EL34, 6H8C, 6922, and 12AX7) have a higher resistance when cold than their continental mates and consequently less inrush current and an increased lifetime. But when applying current, the difference in behavior is rather small and all tubes follow the same curvature. 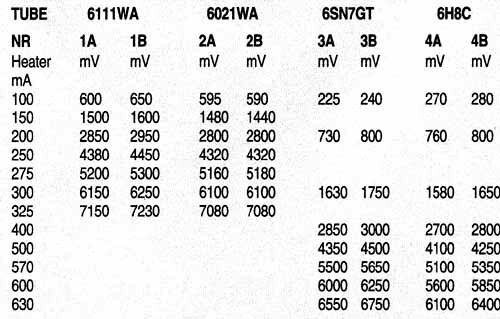 For both the four subminiature and four octal tubes, I listed the voltage with respect to the heater cur rent and produced the list in Table 2 and the curves in Fig. 1. FIG. 1: Tube voltage/heater current. At 300mA the subminiatures 6111WA and 6021WA have a voltage from 6100 to 6250mV, meaning a heating power between 1830 and 1875mW, which is only a little less than the nominal 1890mW (6300mV x 03A). At 600mA the octal tubes 6SN7GT and 6H8C have a voltage from 5600 to 6250mV, and a heating power from 3360 to 3750mW, which is also a little below the nominal 3780mW (6300mV x 0.6A). The specs given by Svetlana allow a voltage of 6300 ±600mV (±9%). This is the same tolerance as in the mains supply voltage in other countries. As you can see in Fig. 1, the change in heater resistance counteracts the change in voltage. This means that the cathode also works very well below the nominal heater voltage. A change in heater voltage of 10% will give a 5% change in heater current and a 15% change in energy instead of 20% with a common resistor. The easier an element can provide an electron emission, the lower its so- called work function. To lower the work function of pure tungsten, filaments are thoriated and work at a temperature of 1800K. By carbonizing the emitter, the rate of evaporation of the thorium layer is reduced by a factor of 6. The oxide-coated cathode is very efficient (20x better than tungsten) and provides a high emission current at a temperature of about 1000K. It contains a metal sleeve of konal that is coated with the oxides of barium and strontium, which combine efficient operation with a long life. According to Langmuir-Child’s law, the space charge current is independent of the temperature and the work function of the cathode. Thus, no matter how many electrons a cathode can supply, the tube’s geometry and the applied potentials will determine the amount of current that is collected by the anode. FIG. 2: Potentiometer 100R-3W set for lowest hum. As mentioned previously, the energy in the heater follows the changes in volt age. I made a test with three sets of four power tubes. The results are shown in Table 3. Only four samples may not be representative for the lot, but it gives me the impression that—apart from some exceptions—the heaters of power tubes are well matched to their specs. In most countries, the mains voltage is stable enough and a regulator is not needed. With an AC supply, the heat capacity of the cathode prevents its temperature from following the instantaneous variation in heater current. In preamps, you may hear the induced noise to the cathode, but you may get rid of it by giving the heater a positive voltage with respect to the cathode (no emission from filament to cathode). For directly heated power tubes as the 211 or 813, a stabilized supply is seldom used. These tubes only allow for a 5% tolerance in the filament volt age. Mostly using them in SE class A mode filament noise is a major problem. With its low gain, the 211 might work with AC for the filament (Fig. 2). The potentiometer across the filament must be adjusted for minimum hum. Using high gain pentodes such as the 813 or with sensitive speakers on a DC supply — even non-regulated—is a must. The 10V DC over the length of the filament will produce an uneven bias and thus an uneven emission of the filament. While relatively small with a high bias voltage, it may become important at low bias and high currents during modulation of the grid. In high power applications, sometimes the filament polarity is changed at regular intervals to balance out the filament wear. As already mentioned, the regulated DC heater supply prevents noise. You can regulate the voltage, the current, or the energy to the heaters. With proper regulation, the filament energy is steady and independent of variations in the mains supply. Without risking a too-low emission, you can lower the heating energy. The filament will like it and last longer. 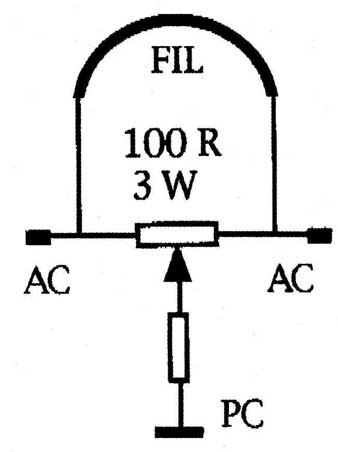 Before regulation, the AC voltage is changed into DC by a bridge rectifier, followed by a filter capacitor (Fig 3). To reduce spikes and strain on the bridge and the filter capacitor, you can put a resistor in the AC line. This will also lower the high inrush current. 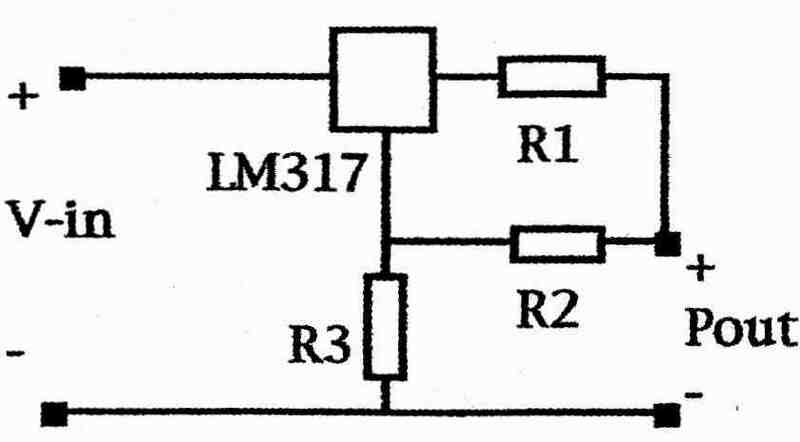 For proper operation, most regulators need a mini mum voltage drop of 3V; hence the regulator input voltage must be at least 3V higher than the output voltage of the regulator, even at a low mains supply. The power loss in the regulator is its voltage drop times the passing current, so use a small heatsink. With two or more heaters, series connection is more efficient than in parallel mode. If you want to connect two similar 6V tubes, put the filament in series to have a low current through the regulator and less heat loss as well. With the newest switching regulators from National, it is quite easy to have a powerful DC stabilizer, as needed for the direct-heated 211, and so on. Look for it at national.com. Current control supplies a steady cur rent to the heaters (Fig 5). Here tube lb gets 1875mW and nr 2, 1830mW, a change of 2.4%. Also, tubes 3b and 4a have 3750 resp. 3360mW, a change of 10.4%. The advantage of current control is its soft start capability. The temperature of and the voltage on the heater rise slowly until stabilization has been reached. In Mr. Kornacker’s example two 150mA heaters are connected in parallel to a 300mA source; here if one heater gives up the other gets the full 300mA. Thus, with current control heaters are in series. FIG. 3: Small ripple on Cf will not pass the regulator. FIG. 4: Left fixed 6 2V reg. Right adjustable reg. Vout = 1 .25x CR2 + R R1V DC. FIG. 5: I-out= 1250: R1mA. 8R2 = 153mA, 4R1 = 305mA. FIG. 6: I-out x (R + R2): R2 = 625mV. I—out x R1 = 625mV. Amps increase 5% to 1.05A and drop in R1 = 657mV. R2 automatically drops to 1250 — 657 = 593mV, corresponding to an output of 16 x 593 = 9488mV, equal to 1.054A in 9 ohm. The power is 9.5 x 1.05 = 9.97W, a variation of only 0.3%. In the good ol’ days, radios and amps didn’t have any precautions against high inrush currents or cathode strip ping and still worked very well for a long time (but not the cheap stuff). Why a nice soft-start for small preamp tubes and not for the power tubes? Some people use the pretty expensive 300B, and I use 211, 813, and ET88, but forget the soft-start. In the DC supply for the 211-813, you can use small series resistors to cut the high inrush current in half. By using a separate heater transformer, you can reduce the AC inrush current with a series NTC resistor in its primary—a bit like in the old and ugly AC-DC radios (Fig. 7). In balanced mode, a power amp has two tubes that have the same anode current, often sharing a bias circuit. Here you can use a 12.6V AC supply with the filaments of both tubes in series, so if one filament fails, the other tube stops con ducting as well. FIG. 7: Using a separate heater transformer, as in an AC-DC radio. FIG. 8: After slowly reaching 12V DC, the relay pulls and switches on the HI. FIG. 9: You can make a very precise with an LM431A. FIG. 10: Using a phi filter. FIG. 11: Use two relay contacts in series if you need to switch high voltages. FIG. 12: Using a split AC supply voltage. FIG. 13: When TDR switches on, the current of the power tubes reaches the full value. FIG. 14: Applying negative bias. FIG. 15: Set voltage divider R1 -R2 to trip Tr at the desired maximum current. To prevent the high voltage from coming in too quickly, you can use a commercial time delay relay (TDR). With a current control for the heater, you can make a TDR by connecting a relay in parallel to the heater. After slowly reaching 12V DC, the relay will pull and switch on the HT (Fig. 8). With an LM431A, you can make a very precise TDR (Fig. 9). At switch-on, Ct charges through Et and LED R is on through Rvl and RL. Ct charges up to the reference voltage of 2.5V and QI conducts, RL pulls, LED G lights up through Rv2, and LED R is off. At switch-off, Ct discharges through Dl, and D2 protects Q1+ RL against spikes. Analog to Fig. 3 DC is made from AC. The HV-DC passes through a filter to eliminate the voltage ripple. SE, Class A amps need a far better filtering than the balanced ones where the ripple cur rents are cancelled out. Filter elements can be capacitors, resistors, chokes, or MOSFETs. Mostly, a phi filter is used (Fig 10) but all have a high inrush cur rent in common. In general the standard relay contacts cannot switch high AC voltages and you may need to put two contacts in series to prevent arcing of the contacts (Fig. 11). However, both the rectifiers and filter caps suffer from this rude switching-on, and it is far better to use a split AC supply voltage as in Fig 12. With the initial low By and a fixed bias, the current of the power tubes starts at almost zero and will reach the full value when TDR switches on (Fig 13). Often the DC-HV is so high that two filter capacitors are series-connected. To equalize the voltage on the caps, bleeder resistances are used—not a very good practice. It would be better to use a split DC power supply as you see in Fig 13. If all filter capacitors can withstand the maximum HV (1.5xV AC), you can use the TDR to control the negative bias instead of the incoming AC volt age. A high enough negative bias will prevent the power tubes from conducting; it can be applied as you see in Fig 14. TDR removes the high negative bias voltage. By sets the bias value. Rk cares for the auto bias and is—in general—a high wattage resistor. I use a combination of a fixed and auto-bias in such a way that both have the same voltage. For example, with balanced EL34s in triode mode, Bk is 100-ohm, Ck has 15V DC, and Rnb is set to have 15V DC on Cnb as well. Please note that in this case TDR only switches the AC supply (Figs. 12 and 13). 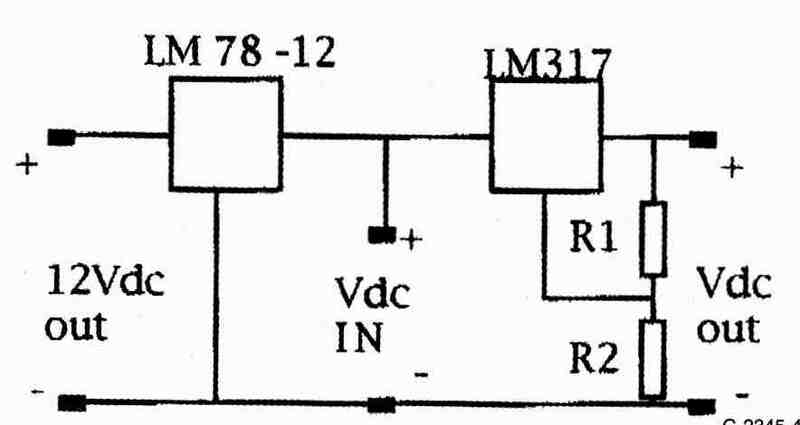 There is no need to change the negative bias voltage of, say, 15V DC; as with this bias, no current flows at start-up. For protection, fuses are used in the power supply, generally in the primary or secondary of the PT. This is quite useless for protecting the power tubes. A fuse in the HV line of the OPT is better, as capacitor charging currents don’t pass through the fuse. It is best to measure the total supply current. If the voltage of resistor Rv rises to 600mV, Tr will conduct, and RL will close, reset ting TIDE, and removing the power. EL stays on by its holding contact, if the currents drop afterwards.